Get ready for the Rock & Roll Express tour!! 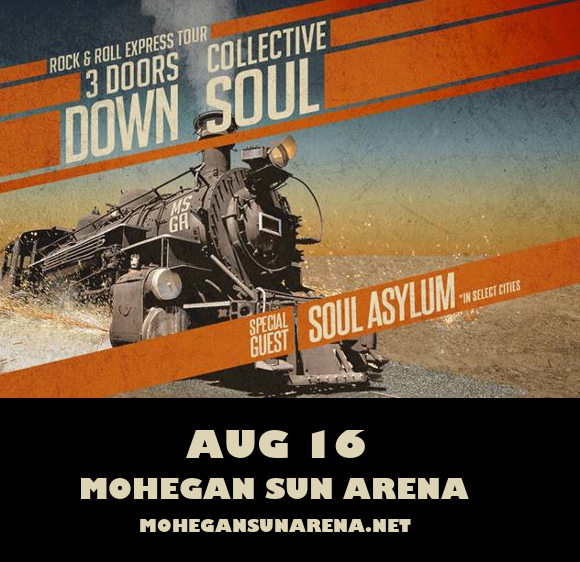 That’s right, 3 Doors Down are teaming up with Collective Soul for a huge North American tour, coming to the Mohegan Sun Arena on Thursday 16th August 2018 – don’t miss it! Tickets are already flying as we get closer and closer to the LIVE event – so what are you waiting for? Grab yours now before they sell out! With their hit single “Kryptonite,” at number 3 on the Billboard Hot 100, 3 Doors Down blasted to worldwide fame, which continued with the release of their album “The Better Life,” which was the 6th best-selling album of the year and achieved 6-time Platinum certification! The band are now touring with their latest album, “Us And The Night”. Get ready to hear all the newest songs plus all the hits you know by heart – have you got your tickets to see 3 Doors Down with Collective Soul yet? ?